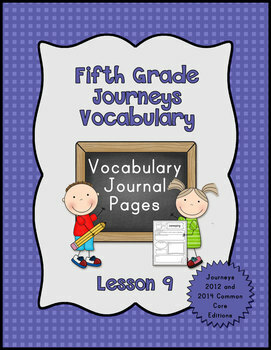 This packet contains vocabulary journal pages for lesson 9 of the Journeys reading series for fifth grade. 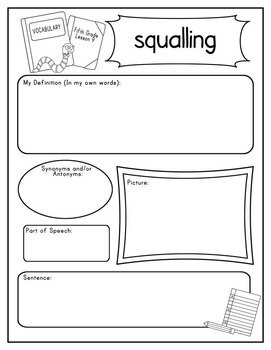 Words in this lesson are vocabulary words that appear in both the 2012 and Common Core Editions. The words include critical, demolished, elite, squalling, secured, realization, clammy, commotion, bundle, annoyance. The packet includes journal pages in five styles. 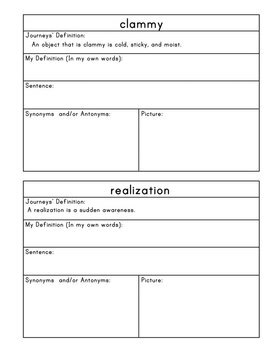 The first style is full page and contains the Journeys’ definition and room for the student to write his/her own definition. The second full page style does not include a prewritten definition. There is a third full page that is blank and can be used with any word. 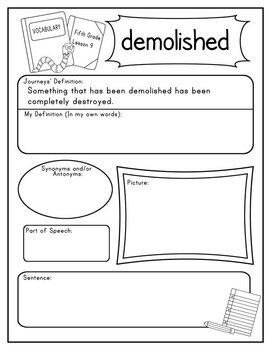 The half page styles include one with the Journeys’ definition and one blank to by used with any word. You can find other materials to supplement the Journeys Series in my TpT store.